In a self-organized group, you can support each other and fight together for your right of family reunification. The trainings are free of cost. Translation, child care and food are offered. BVG tickets’ costs will be refunded. You will be able to pass on the acquired knowledge as a speaker in the new group that will follow. Demand the right of family reunification! Arrange for the children to join in a legal way! Fight for a secure residence status! At Flamingo e.V. we have two federal volunteer service places for refugees in cooperation with the Naturschutz Foundation. The Safe Nest project, in collaboration with the Amali-Foundation, provides eight places for pregnant women or mothers with infants. In addition to a safe place to live during the first period of motherhood, the residents are fully cared for and accompanied. 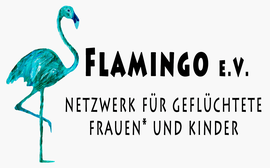 During the Federal Voluntary Service the refugee women* receive 200€ per month in addition to the regular welfare money as well as the financing of German courses. For the further qualification of women* we cooperate with glokal e.V. and their training program "Welcome without paternalism". Two refugee women* from Flamingo e.V. startet the training in October 2016 and they completed it in June 2017. Both are already experienced in political education work and are now able to provide sensitivity training for white supporters as well as empowerment workshops for refugees. We are already in touch with other associations and foundations to provide the refugee women* with further training opportunities in other fields of action.